Our daughter, Presley Elizabeth, was born on Sept. 22, 2005. 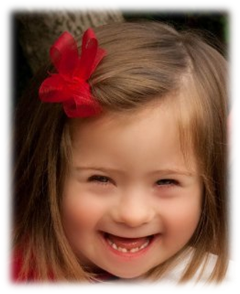 We found out that she has Down syndrome (trisomy 21) about an hour after she was born. We wanted to do something that would make a positive impact and help others to see the UPSIDE of DOWN syndrome. Upside Of Down is a non-profit 501(c) (3) organization with a mission to increase Down syndrome awareness, education, research, and provide opportunities for individuals with Down syndrome. We hope that you'll share this with your friends and family and maybe even get involved in your community to volunteer and/or donate to Upside Of Down or other organizations that support Down syndrome.